Pułtusk ([ˈpuu̯tusk]; German: Ostenburg) is a town in Poland by the river Narew, 70 kilometres (43 miles) north of Warsaw. It is located in the Masovian Voivodship and has a population of about 19,000. In 1339 Pułtusk was granted town rights and throughout the 15th and 17th centuries, it was one of the most important economic centres in the Masovian region. The favorable placement of the town on the Narew River, where grain and other goods were transported to the port of Gdańsk on the Baltic Sea, contributed to the town’s growth and importance. Moreover, the construction of Europe’s longest paved market square (380 meters in length) was a sign of the town’s economic success. During the millennium of its existence, Pułtusk was possibly the most invaded town in Poland. Despite the extent of the destruction, especially during World War II, the town has been reconstructed. It is now one of the most recognized and admired tourist destinations in the north-eastern part of the country because of its historical and unique architecture. It is one of the most popular weekend destinations for residents of Warsaw. Pułtusk is one of the oldest cities in Poland. Its Italian-influenced architecture, canals and floating gondolas have resulted in its being known as "Little Polish Venice". The town has existed since at least the 10th century. In the Middle Ages, the Castle in Pułtusk was one of the most important defensive forts in northern Masovia against the attacks of Old Prussians and Lithuanians. 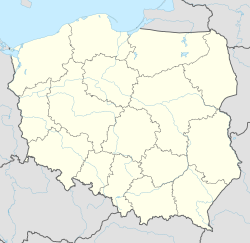 According to a legend, the town initially was known as Tusk; however, after a flood that destroyed half of the city, it was renamed as Pułtusk (Pół- or puł- being a Polish prefix for a half). Most historians believe that it was named after a small river known as Pełta. From the 11th century onwards, the town belonged to the bishops of Płock. Due to a ford on the river located nearby, Pułtusk became an important centre of trade and commerce. It received its civic charter in 1257, modeled after that of Chełmno (Kulm law). In 1440 an academy was founded in the town, and it became one of the most influential schools of higher education in the Polish Kingdom. Among its professors were Jakub Wujek and Piotr Skarga. By 1595 there were more than 600 students, and their number reached 900 by 1696. The town was destroyed by Lithuanians in 1262 and 1324. In the 14th century, Pułtusk became the official seat of Płock bishops. The town was again burnt by Lithuanians in 1368, but following the Union of Krewo the Lithuanian raids were stopped, and the town quickly recovered. By the 15th century Pułtusk's merchants were among the richest in Poland. The town was granted a privilege of organizing nine grand markets a year and two small markets a week. The city also gained much profit from exporting wood and grain to Gdańsk, as well as from mead and beer production. In around 1405, the Mayor's House, today known as the "Polonia House" or "Polonia Castle", was constructed. In 1449 a Gothic church was added to the city's facilities. In the 16th century the castle was rebuilt by several renowned Italian architects, including Giovanni Battista of Venice and Bartolommeo Berrecci, and Giovanni Cini of Siena. In 1566 one of the first public theatres in Poland was established in Pułtusk. In the 16th century the town was visited by many notable individuals, such as Jan Kochanowski, King Sigismund III, and Maciej Kazimierz Sarbiewski. In 1530 the first Masovian printing house was opened. On 21 April 1703 during the Great Northern War, a decisive battle was fought in Pułtusk, where the Swedish army under Charles XII defeated and captured a large part of the Saxon army under Graf von Steinau. Although the town and the castle were initially conquered by Polish forces, they were later recaptured by the Swedish army, which looted and destroyed it. After the Partitions of Poland, the town was annexed by the Kingdom of Prussia. The Polish forces of General Antoni Madaliński stationed in Pułtusk in 1794 declined to obey Prussian orders and started their march towards Kraków. This marked the start of the Kościuszko Uprising. Prussian rule lasted only a few years. Another Battle of Pułtusk was fought on 26 December 1806, between forces of Imperial Russia and Imperial France. The battle became so famous that its name is inscribed on the Arc de Triomphe in Paris. After the fall of Warsaw in 1809, Pułtusk became the temporary capital of the Duchy of Warsaw. After the fall of Napoléon Bonaparte, the town was annexed by Russia. During the November Uprising, the town changed hands several times. In 1831 Russian forces were carrying a cholera epidemic when they entered the town, resulting in high fatalities. Pułtusk inhabitants took part also in the January Uprising. Afterwards the town was utterly destroyed and Russian officials sent many prominent citizens were sent to Siberia and internal exile. On 30 January 1868 a meteorite fell in Pułtusk. It was one of the biggest to fall in Europe. Large chunks (9 kg (20 lb) each) were acquired by the British Museum, which has them on display in London. The great fire in 1875 destroyed most of the city. It was depicted by Nobel Laureate Henryk Sienkiewicz in his novel Quo Vadis as the great fire of Rome. The town was a battleground in the Polish-Soviet War of 1920, at the eve of the Battle of Warsaw. In 1931 the town had some 16,800 inhabitants. As a result of the German invasion of Poland in 1939 it was occupied by military forces and incorporated into Nazi Germany. From 1941-1945 it was known in German as Ostenburg. During the German occupation, approximately 50% of the city's inhabitants, mostly Jews, were forcibly deported, some to concentration camps. In the battle for Pułtusk during later World War II, over 16,000 soldiers of the Soviet Red Army were killed. As a result of the battle, approximately 85% of the city was destroyed. There was a strong Jewish presence in Pułtusk before the Holocaust. The first Jews here settled in the 15th century, but the community only started to flourish in the 19th century. At the start of the 19th century, about 120 Jews lived in the city. Others lived in shtetls outside the city. Throughout that century, though, the Jewish population increased rapidly to nearly 7,000 in the mid-19th century. By the year 1900, around 6,000 Jews lived in Pułtusk. Many had migrated to nearby Warsaw before and after World War I. Others emigrated to the United States. Following the war, the Jewish population rose to about 7,500 and accounted for roughly half of the total population of the town. On September 7, 1939, the city became under the control of Nazi Germany. On September 27, the Germans deported most of the Jews to concentration camps. Some eventually made their way to the Soviet border but many died in the camps. In the 21st century, descendants of Pułtusk Jewry are found mainly in Israel, the United States, Canada, and Argentina. ^ a b "Local history - Information about the town - Pułtusk - Virtual Shtetl". Retrieved 30 March 2017. ^ "Pułtusk – atrakcje i kosmiczna historia mazowieckiej Wenecji". 25 April 2014. Retrieved 30 March 2017. ^ Gilbert, Martin (15 May 1987). "The Holocaust: A History of the Jews of Europe During the Second World War". Macmillan. Retrieved 30 March 2017 – via Google Books. Wikimedia Commons has media related to Pułtusk. This page was last edited on 3 April 2019, at 12:21 (UTC).